It’s a meditative job, driving the sweep boat. Without any passengers vying for your attention, curious questions unasked, unanswered. 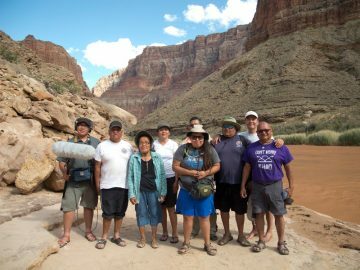 With a departure time way before the breakfast dishes have been dunked into the fourth bucket, before the last call for the Groover, before the sun has breached the protective walls of the canyon, the sweep boat floats away from camp. 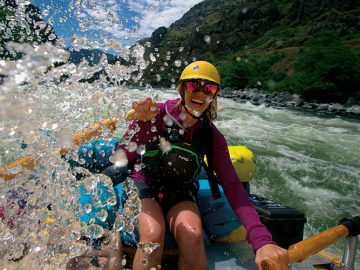 The current, the breeze, and the technical maneuvers needed to pass through narrow canyons and Class IV rapids are the only things to ponder. It’s a quiet routine. One I would envy had I not been a guest—a silent passenger aboard the sweep. Even in all his goofiness and outgoing personality, I could tell Ned Perry cherished these secluded moments on his sweep. I tried to keep my questions to a minimum and just appreciate the moment, this moment: the only two people on the Middle Fork of the Salmon River. Or so it felt. 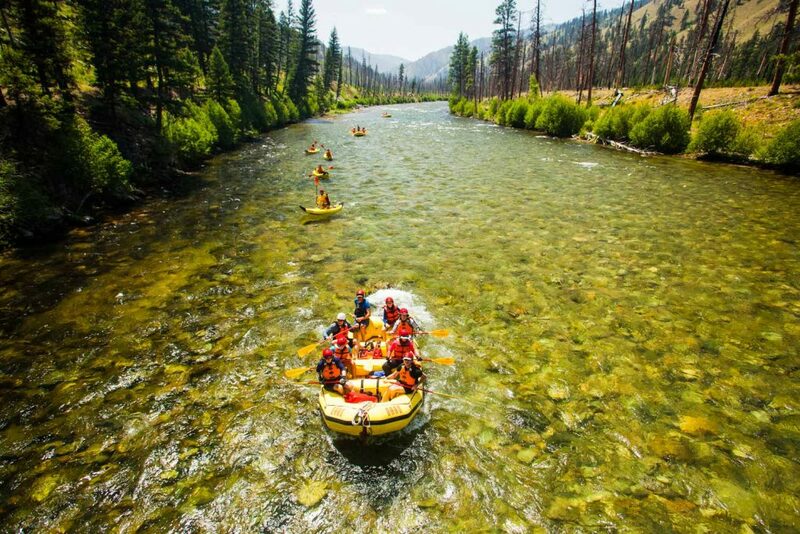 Nestled in the 2.3-million-acre Frank Church Wilderness Area—the “Church” as many locals refer to it—the Salmon River is one of the longest free-flowing rivers in the Lower 48. Flowing from its headwaters in the Sawtooth Mountain range (over 9,200 feet), the Salmon dramatically drops in elevation until its confluence with the Snake River north of Hells Canyon, more than 7,000 feet lower in elevation. 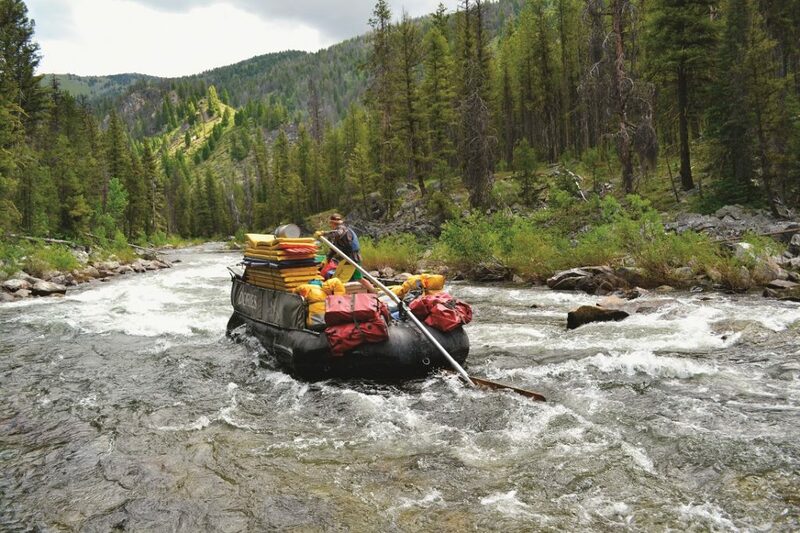 It’s the constant gradient of the Middle Fork of the Salmon that allows the use of sweep boats to carry gear to camp ahead of the rest of the party. Sweep boats are massive inflatable crafts, ranging from 22- to 26-feet long with tubes reaching 30 inches in diameter. Unlike other oar-rigged boats, the sweep’s oars—called sweeps—are positioned at the bow and stern. Because of the sweeps’ positions, they don’t propel the boat through the water, but instead only turn the boat from side-to-side, changing its angle to skirt obstacles, depending on the river’s flow to move it downstream. The sweep boat isn’t a modern invention. In the 1870s and 80s flat-bottomed, wooden boats, called scows, were built to transfer mining equipment and lumber downriver. It began with a 39-mile trip from Salmon, Idaho, to the mines in Shoup, Idaho. Once the scow reached Shoup, the entire boat was dismantled and sold as lumber. Returning the scow to Salmon to be re-used was impossible. 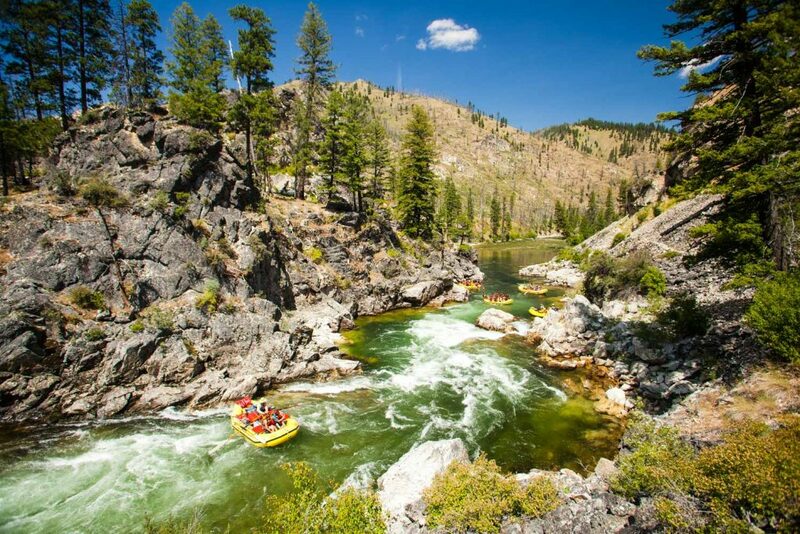 This is where the Salmon River’s moniker, “The River of No Return,” originated. I’m not from Idaho. Having relocated five years ago from a small town in North Carolina, I was fascinated by the history of the massive boat I was riding on. Accustomed to the local lore of my childhood, which included the infamous pirate, Black Beard, and the numerous calamities early settlers faced in the New World, when I had heard the term River of No Return, my mind had turned to the macabre. “A trip down the River of No Return was a one-way ticket,” said Ned. At least for the scow. Captain H. Guleke is one of the most famous scow drivers from the 19th and 20th centuries. His first trip in 1896 is believed to be the first documented passage between Salmon—known then as Salmon City—and Riggins in a scow, a trip totaling more than 150 miles. Before Guleke, the route had been deemed impossible. For the next 37 years, Guleke continued to navigate the Salmon by scow, floating his original route at first, but eventually pushing on to Lewiston (a total of 305 miles), dismantling the scow there, and using the lumber profits to buy a horse (and eventually hop a train) and return to Salmon to do it again. At this point in history, settlers began staking claims along the river and the earliest mining towns and homesteads were established from recycled scows. Sweep boat drivers on the Middle Fork today are far from famous. But I think it’s safe to say Ned is a hometown favorite. Ned and other sweep drivers have it easy compared to the scow drivers of the 1800s. But it doesn’t come without risk, and taking those risks every single day of a multi-day trip doesn’t come without serious consequences. From losing a camp’s worth of gear (potentially ruining a few family vacations) to losing your life, the consequences can be brutal. Ned has been driving sweep for eight years. In the few moments I pried into the history of the boats, I also pried into Ned’s on-the-water history. He spent two years training before he unexpectedly became the go-to sweep boat driver for OARS one season when another boatman suffered an injury. A third driver slowed down to the occasional trip. So, for the past six years, Ned has found himself day-in-and-day-out, trip after trip, spending his days in the quiet atmosphere of the sweep. 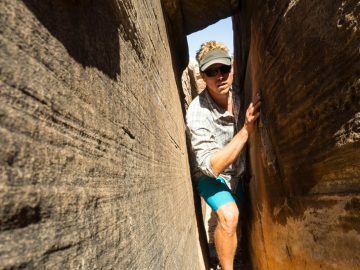 “Tuck your feet in, hold on and be prepared to hit the rock wall on river left,” Ned said as we neared Pistol Creek, a rapid confined by a narrow canyon. All guides prepare in advance for a rapid, successfully styling one (seemingly) without effort, while their mind is on the next rapid far beyond the average guest’s gaze. Ned takes that planning and preparation one step further. 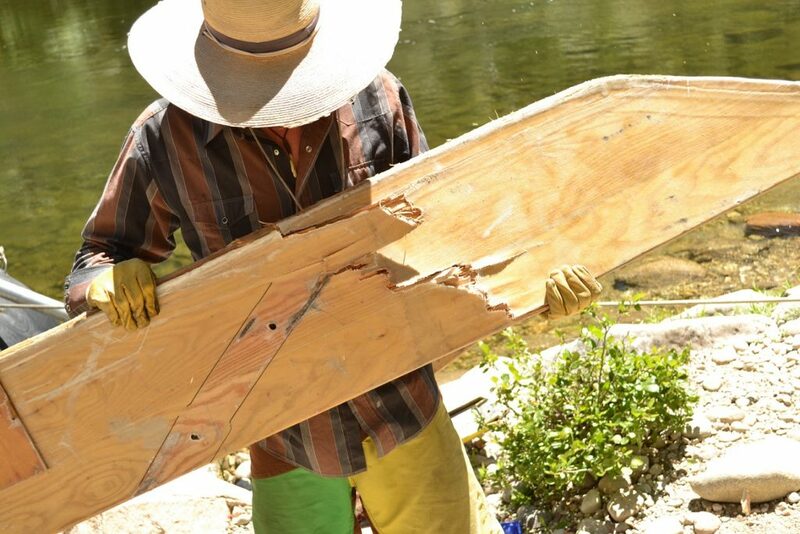 Moving a sweep boat by a slight angle takes time. With his feet firmly planted, we entered Pistol Creek. I was too focused on not falling out of the boat, not smashing a body part against rock and attempting to take pictures to watch Ned, but I imagined his face growing more red, his eyes focusing on the line to take—not the obstacles to miss—and using his entire body to move the poles attached to the sweep. I heard a thwack. Something hit rock, hard. In the end, Ned did his job too well. He overcompensated the angle to miss the wall, but came too close to a boulder, smashing his front sweep. Like a compound fracture, the sweep hung at an odd angle. We stopped at Indian Creek Ranger Station to assess the damage and salvage discarded wood for the sweep’s repair. Ned decided we could make it to camp with the broken sweep where he could take the time patch it. I guarantee the first scows underwent some inventive repairs. When you’re riding alone you have to possess a hint of innovation to overcome unexpected setbacks. But sweep boat drivers aren’t totally alone. Sure they pass the private and commercial trips lounging on beaches, sipping morning camp-coffee and leisurely rigging for the day ahead. And normally they don’t have passengers perching on Paco pads to share their space with. But the sweep boaters of the Middle Fork have created their own community, complete with a postal service. Most sweep drivers have secret hiding spots, or “mailboxes,” littered along the river’s banks. From thoughtful gifts to blank paper and pen, little treasures are stashed in these mailboxes for fellow sweep boat drivers to enjoy or leave a note behind for a friend on the river to read in the coming weeks. I was impressed by the camaraderie between the sweeps, despite the logos plastered to the rubber and PVC. When I pushed us off from Sheepeater early that morning, my stomach was full of strong coffee, buttery croissants and an omelet. I was fully aware that lunch wouldn’t be the catered fare I had already grown accustomed to. Sweep drivers usually eat dinner leftovers, but having had grilled salmon the night before, leftover fish wasn’t an appetizing second-meal. I expected nothing more than a repeat of Ned’s lunch yesterday: hummus and chips. After we reached Marble Creek Left, set up the chair circle, built individual pyramids of sleep-kits, tents, and dry bags, and repaired the sweep, two sweep boats from another company eddied out and tied off. We climbed aboard to swap trip recaps over cold beers. My stomach growled, running on breakfast fumes. “You guys want some bucket food?” one of the crew asked. Ned smiled. Bucket food didn’t sound appetizing; I stayed silent and watched. The girl who’d asked hopped over to the other sweep and returned with a Dutch oven filled with rice, beans, sausage and veggies—bucket food: breakfast leftovers. They passed around corn tortillas and we feasted on a Mexican lunch. They didn’t expect anything in return. They knew Ned would repay them, or another sweep boat down the river. Maybe not this trip, but in the end it all comes full circle. As they returned to the current to continue on to whichever camp they would call home for the night, we waved and headed into our own camp to relax and unwind before the guests arrived and the evening regimen began again. I only rode on the sweep that one day. For the rest of the trip I chose to relax on an oar-rigged raft, with the occasional jaunt on a paddleboat. Without having to paddle, I had the time to take in my surroundings and quiz the other guides on their Middle Fork history. Captain Guleke made a cameo in everyone’s historical accounts. On the last day of the trip the Middle Fork merges with the Main Salmon. For four miles you float the Main until taking out at Cache Bar. To miss the crowds and hasten the process of derigging and shuttling the guests back to Salmon, we took off at a small boat ramp three or so miles before Cache Bar. As we eddied out, waiting our turn, my guide pointed to a small cabin on river left. “Used to be owned by two scow drivers, Don and Clyde Smith,” he said. “But I’d check the validity of that before you publish it. You know how boatmen’s stories are.” I snapped a picture just in case. 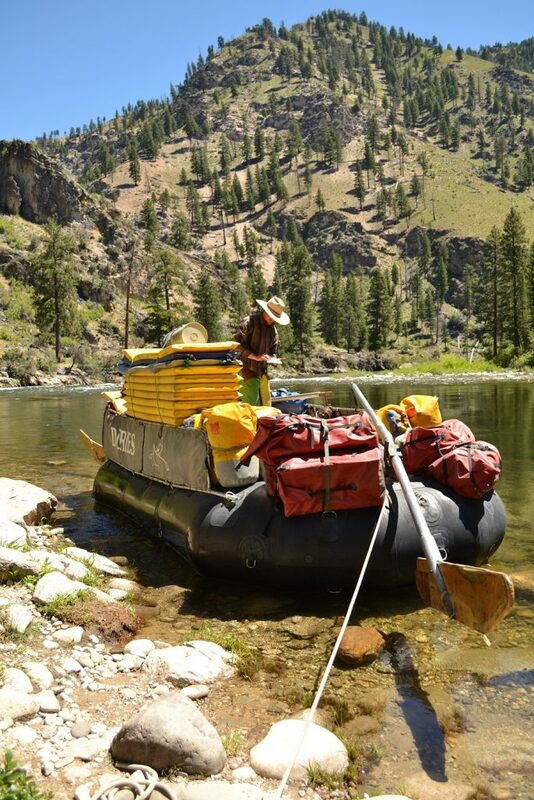 My first time down the Middle Fork was the final voyage for this particular sweep boat. With a busted sweep, the boat specially made by Firestone in 1978 was set to retire. If a sweep could talk, I’m sure she’d say her goodbyes, as I said goodbye—for now—to the River of No Return. This article appears in the OARS 2017 Adventures Catalog. For more tips and travel inspiration, request a free copy. Photos courtesy of Ashley Peel and Justin Bailie. 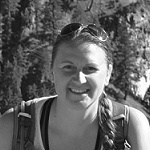 Ashley is the Marketing Editorial Coordinator at NRS – Northwest River Supplies, Inc.